Meet young makeup artist Dilshad Ukaji. At the age of 25, she is assisting one of the biggest names in the Indian makeup industry -- Cory Walia -- and travels the world on assignments. Here, in an interview with Rediff.com's Sanaya Dalal she discusses her successful career and gives us a peek into the functioning of the makeup business. Tell us a little about your background -- how did you get into the make-up industry and at what age? I'm 25 years old, I come from a Parsi family and I got into make-up once I graduated from HR College. I hadn't planned on becoming a makeup artist as such, but I always wanted to get into something connected with beauty, haircare etc and so I enrolled in Schnell Hans International (a chain of beauty schools and salons) for a complete beauty and hair course. Part of this course included bridal makeup and I really enjoyed that -- I also realised that I couldn't deal with hair! So that's how make-up happened. Unfortunately, India still does not offer proper makeup courses for professionals, so I also went to London to complete a three-month course at the London School of Beauty and make-up. Once I came back, a family friend introduced me to Cory Walia and that's how I landed my present job. Little is known about becoming a professional make-up artist -- what inspired you to pursue such an unusual career and how did you go about it? If a youngster is interested in this line of work today, how should he/ she pursue it? I think people are now more aware of taking up makeup as a profession, as compared to four or five years ago. I've been in the industry myself for three years now and I can actually see it, so many more people are opting for it, which is why it's getting a lot more difficult to get in. As for what inspired me to get into it, I love to make people look their best -- it appeals to me to help someone make the most of their looks. Confidence comes into most people as a result and my work is appreciated. To become a makeup artist you need to have a basic knowledge of fashion and know a little bit about colour; you also need a few artistic skills. Other than that, you don't need to have any natural talent, as such. Being a makeup artist also has very diverse aspects -- you can work on film, television, bridal, fashion and editorial (magazine) assignments. I basically am a freelancer and at this point of time I'm into it all -- I work on whatever assignments come my way, but personally I enjoy doing bridals, because the money is good and it's quick work. Two-three hours and it's done, you get paid off. Also, I travel a lot with Cory, both within the country and abroad. We mainly go for bridal assignments abroad -- people have a lot of destination weddings, but they book makeup artists from Mumbai. While it may be cheaper to hire a local makeup artist from there rather than pay our travel and living costs, it�s the quality of our work that clients are interested in, most of who are rich Indian NRIs. You do one wedding abroad and if things have worked out really well, on the merit of that assignment you land several more. Makeup is a lucrative line, there is a lot of hard work involved and after a certain point if you've made a name, a mark for yourself, you can earn a lot of money. Even if you're a young freelancer you make a lot of money, provided you have the right contacts and you know how to secure assignments. 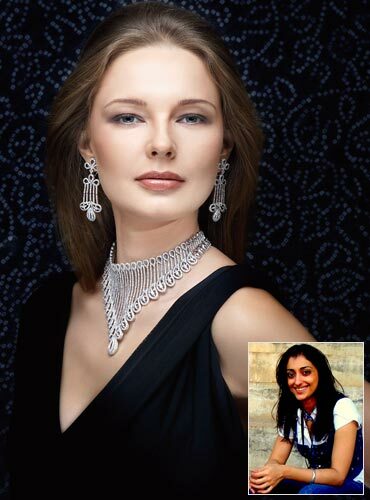 Caption: Dilshad Ukaji (inset) and a sample from her portfolio; the photograph seen above and those in the following pages are from campaigns for leading luxury brands.